Himself the son of a painter, Leonardo Grazia, known as Leonardo da Pistoia, is documented in Lucca and then in Rome from the early 1530s. During the 1540s he moved to Naples, where he would prematurely die. Grazia’s output, which is being only recently rediscovered, is certainly indebted to the refined lines of Perin del Vaga and Giulio Romano, as well as Bronzino, whilst managing to maintain a highly recognisable trait in the idealised feature of his characters, equally distributed between Religious and Profane ones. Amongst his masterpieces, one should remember the Venus and Adonis (Capodimonte, Naples) and the Presentation to the Temple (also at Capodimonte). 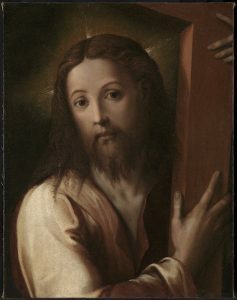 The present Christ Bearing the Cross strongly recalls one of the same subject in the Bob Jones University and Museum Gallery (Greenville, South Carolina), already attributed to Leonardo Grazia by Federico Zeri in 1977. The Bob Jones version, together with a second one in the Doria Pamphilij collection, Rome, is heavily influenced by Sebastiano del Piombo’s from circa 1537 (Hermitage, Saint Petersburg). In comparison, the present Christ displays a higher degree of originality, the Christ shown staring the viewer in the eyes but with no crown of thorns nor any other signs of sufferance.